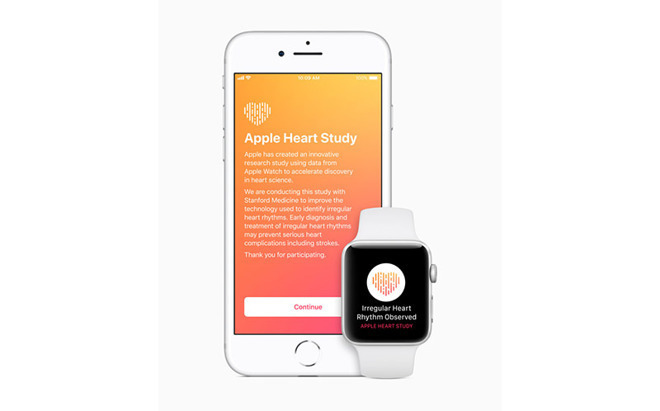 It takes five incidents of detected atrial fibrillation — Afib for short — before an Apple Watch will actually alert its owner to the condition, Apple's VP of Health said on this weekend's publication of the Apple Heart Study, run in conjunction with Stanford Medicine. The threshold was created after talking with the medical community about how to prevent false positives, Dr. Sumbul Desai told Men's Health. While not necessarily a problem in itself, Afib can be a precursor to strokes, blood clots, or even heart failure. Of the study's 419,093 participants, only 0.5 percent received an alert. That ratio fell to just 0.16 percent for those under 40, but climbed past 3 percent for people over 65. "This tracks with physicians' understanding of Afib as being more common as you get older," Dr. Desai said. He cautioned though that even the Series 4 Watch — which includes an electrocardiogram sensor — is not meant to diagnose someone, but simply prompt wearers to see a physician. Other facts gleaned from the study were that 38 percent of participants had an obese BMI, 21 percent had high blood pressure, 5 percent had diabetes, and 1 percent had experienced an earlier stroke. Many participants reportedly did follow up with their doctors if they saw an Afib warning. The Apple Heart Study is said to be the largest such study in history, easily dwarfing the 5,209 of the Framingham experiment. "It shows Apple has the operational capability to do large-scale virtual trials," Dr. Desai commented. Apple is already embarking on another project with Johnson & Johnson, meant to determine whether the Watch's Afib detection can prevent strokes. The Stanford results were shared during a presentation at the American College of Cardiology's annual conference on Saturday. Apple first announced the study during the launch of the Series 3 in 2017, but only closed enrollment in August 2018, finally ending data collection this January.